At least Klopp was right about one thing on Wednesday night (unless you count the post match – “we deserved to lose”), which saw Dortmund crash out of the Champions League with a very poor performance against an excellently-organised Juventus. The game highlighted the recurring issues of the German’s possession game, as they struggled significantly to break Allegri’s defence down as they were allowed the majority of the ball (56%) with no threat at all. This came as little surprise following Klopp’s side inability to break down both Hamburg and Koln in their two most recent matches, whilst the defensive excellence of the Old Lady simply emphasized the weaknesses which has led to BVB’s poor campaign. The home side lined up in a 4-2-3-1, with perhaps the surprise inclusion of Sokratis at right-back in place of the great Oliver Kirch, who had shown his ability in the Revierderby of last month. The Greek defender was on the right side of a defence which featured Marcel Schmelzer at left-back, with Mats Hummels and Neven Subotic centrally, whilst goalkeeper Weidenfeller came under criticism behind them. A pivot of Gundogan and Bender started behind a trio of Kevin Kampl, Mkhitaryan and Marco Reus, who played behind the lone striker Aubameyang. In the other dugout, Allegri set his team out in their standard 4-1-2-1-2 formation, making use of the excellent central players in midfield. Gianluigi Buffon started as goalkeeper behind a defence of Lichtsteiner at right-back and Evra on the left, flanking a centre-back partnership of Chiellini and Bonucci. Claudio Marchisio started as the lone six in place of Andrea Pirlo who was injured in the first meeting, behind the aggressive Arturo Vidal and Paul Pogba, who was later injured. Roberto Pererya started high in attacking midfield, with the excellent Carlos Tevez and Alvaro Morata leading the attacks. For the first 25 minutes until Pogba’s unfortunate injury, Juventus played in a 4-1-2-1-2 formation which was excellent defensively, nulling any Dortmund (albeit predictable) attack. In their own third, it very much became a 4-3-1-2 with the carilleros – Pogba and Vidal moving quite wide to flank Marchisio, with this BVB failed to capitalise on any theoretical wide advantage given the typical 4-1-2-1-2’s narrow shape in the centre. This meant that the 3 deepest Juve midfielders were in good positions to man-mark the ‘3’ of Dortmund’s shape, which they did so to good effect, whilst a 3v2 in the away side’s favour was often created around Gundogan and Bender, as the strikers dropped deep. The way the two systems matched up, it left the BVB full-backs free but this offered little advantage to them, especially on the right. 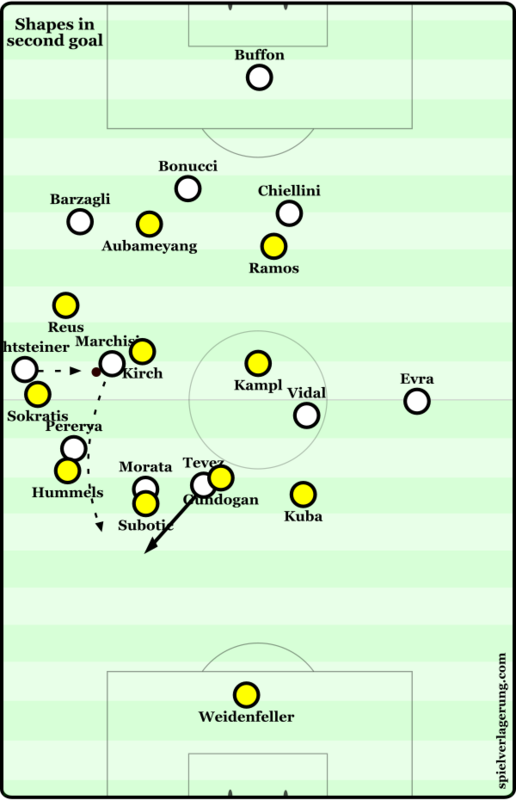 There were one or two cases in the start of the match, where BVB could find a free man (a pivot pushed up) in the half space, as the near wide midfielder moved out towards the touchline, however they were pressed instantly and couldn’t find profit from these situations as they were always outnumbered. 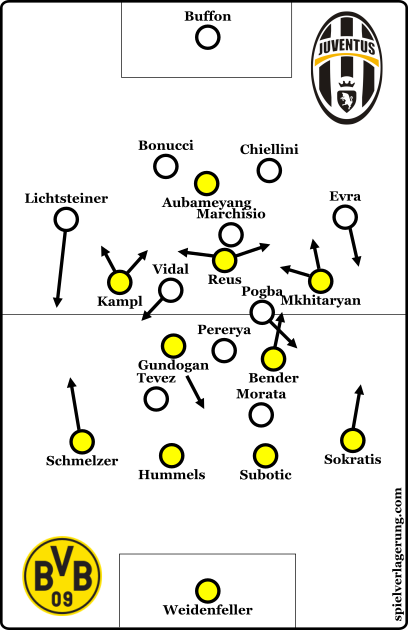 The narrow shape forced BVB’s build-up to the flanks nearly every single time, which was an issue for Dortmund as not only could they be pressed against the touchline, making progression from these areas difficult, but Sokratis offered little in the development of possession (Kirch on the other hand…). In these areas, Juve defended well with good compactness to stop BVB in their possession, as both the wide midfielders pressed well (Vidal especially) with good support as they had numerical superiority near the ball in the majority of situations. Central counters through the front 3 were essential in this system, and threatened even in the 2nd minute, when Morata picked up the ball in the 10 space to drive forward with Tevez and Pogba either side of him. Despite expecting these situations, as Klopp talked about them himself, BVB struggled to cope in defensive transition quite frequently, as Juventus worked well against their below-average counterpressing, which was often beaten through intelligent diagonal passing through midfield. In reaction to Pogba’s injury, Allegri replaced the Frenchman with an extra centre-back, reverting to the 3-5-2 formation which had brought the Italian team so much success in Conte’s reign. Unsurprisingly, Juventus’ gameplan didn’t change along with the alteration of shape, as they maintained a compact defensive block, with the near-side CB and CM moving out to prevent BVB gaining dominance in wide areas. They continued to allow Dortmund possession of the ball, with knowledge that if they controlled the central spaces just like they had done in the 4-1-2-1-2, then they would have no trouble in nullifying the home side’s attacks. The back 3 supported against the Aubameyang and Reus partnership, with centre-backs stepping out when marking one of these, often into the half-space when Dortmund looked to play through the wings. In a small number of situations, Dortmund found a threatening position by switching from one side to the opposite half-space, whilst Juve were in a back 5 with the full-backs oriented on BVB’s wider attackers. However this ultimately provided no results, as Dortmund lacked the pace to exploit such moments before Juve regained defensive stability. In this situation, with Sokratis and Kampl high, Juve are pushed into a 5-3-2 with Mkhitaryan dropping to create a 3v3 in the centre. This left Kirch as a free player to drive into. However, BVB couldn’t quickly get supporting players around Kirch and the attack again slowed to an eventual stop. The absence of Nuri Sahin in the pivot was glaring, as Dortmund had no ability to penetrate the centre of the pitch which admittedly was controlled very well by the opposition. Without the Turk, Dortmund carried much less threat in possession and the speed of their circulation of the ball was lacking significantly, which was the same story in the past two 0-0s where Sahin was absent. The deep block of Juve made it difficult for Aubameyang, who failed to utilise his pace without space behind to access – that being said, he still offered more than Immobile or Ramos would have done from the start. With no space in behind and an inability to access the ‘3’ behind Aubameyang, Dortmund struggled significantly in their chance creation, as they registered their first shot on target through Kampl in the 62nd minute. With Juventus controlling centrally, BVB were quite focused on using possession in wide areas, where the near-side attacking midfielder would support alongside Reus situationally, whilst the full-back moves higher and occasional support from the near pivot. However this offered no threat as not only do these spaces offer little attacking potential with less movement available against the touchline, but Juve defended these spaces very well and BVB lacked in some positions, most notably at right-back where Kirch should have started. One issue with BVB in possession was their switching. When moving the ball to the opposite side of the pitch, they were extremely slow in doing so. Because of this they couldn’t exploit Juve’s horizontally compact 4-1-2-1-2, as the away side could easily shift to the other side in time so that the BVB full-back couldn’t exploit potential gaps. This could’ve been key as Juve were quite considerably compact around the ball, leaving a lot of space available in opposite areas, however this simply couldn’t be utilised without a fast switch which was never on hand, both in terms of moving the ball and getting teammates in supporting positions to use the newly-created holes. In the 62nd minute, Dortmund gave up on football and made two changes to move to a 4-4-2 formation, with Ramos moving upfront with Aubameyang, and Kuba coming on at right-back with Kirch moving into a central position. This is a common last resort move by Klopp and rarely, if ever, proves successful. In possession, BVB were just as isolated on the ball, just as slow and lacked any ability to break down Juventus, even if Ramos theoretically offered aerial support against the low block, with Aubameyang doesn’t. Without the ball, this change also caused issues, which were shown in the build-up to the second goal of the night. The 2v3 in Juventus’ backline made it easier for the away side to pass out of the defence, in comparison to the 3v3 which was often created with the 4-2-3-1 formation. This was typified as Juve progressed into midfield without challenge, where they could easily for a combination to free Marchisio who had time to play a lofted ball to put Tevez through on goal. In summary, although credit has to be given to Allegri’s side, the main point of the game was definitely the miserable performance of BVB in possession, which has been a recurring feature of their season in the Bundesliga. This makes it 3 games now without a goal after their 3-0 demolition of Schalke in the Revierderby, which can be pinpointed to a number of issues which Klopp and Buvac must resolve, both in tactical aspects and personnel. As for Juve, they can look forward to a quarter-final match after such a convincing victory, with the possibility of Allegri improve on what Conte failed to do and progress into the semi-finals. Lichtensteiner said after the game their goal was to defend the center and crosses from Dortmund were not their mayor concern. With Piszcek missing, Dortmund has no full back with quality. On the right there is no real backup, a problem for years. And both left backs have their limits. This shows the failure in squad management. Not only that Dortmund has a deficit at the full back position, they also fielded no real winger. It must be difficult to stretch the play or play different variations when your lineup is focused on playing through the middle. And Juventus knew what they were facing. This is a tactical or strategical problem but also a proof that Dortmund has missed to strengthen their squad at all necessary positions. I didn’t see that comment from Lichtsteiner but he sums up Juve’s strategy well. The selection wasn’t good. Klopp and Buvac would (or definitely should) have expected this approach from Juve, and could’ve made a line-up to better support wide possession or, maybe have the likes of Kagawa in who would help them against the compact defence. Though not sure if the latter approach would’ve worked at all because Juve were pretty great. I’m looking forward to seeing what they do re: transfers in the summer for sure.